We have parking at our front door, Follow directions at bottom of page or refer to the map below. FROM PHILADELPHIA AND SOUTH (via I-95 N) Take I-95 North to Exit 49 (Newtown/Yardley). Turn left at the traffic light at the end of the exit ramp onto Newtown-Yardley Road (Rt 332 West / Newtown Bypass). Follow for approximately 3.1 miles to the seventh traffic light (One Summit Square is on the left corner at the intersection). Turn left onto Langhorne-Newtown Road (Rt 413 South). Follow for 1.0 miles to the second traffic light. Turn left into St. Mary Medical Center. See Campus Directions below. FROM PHILADELPHIA (via US-1) Take US-1 North (Roosevelt Blvd.) to the Bellevue Avenue exit (toward PA-413). Turn right onto S. Bellevue Avenue for 0.1 miles. At the flashing red light, turn left onto S. Pine Street (PA-413). Follow PA-413 North for 2.7 miles (approx. 4 traffic lights) and turn right into St. Mary Medical Center. See Campus Directions below. FROM TRENTON AND NORTH (via I-95 S) Take I-95 South to Exit 49 (Newtown/Yardley). Merge right at the end of the ramp onto Newtown-Yardley Road (Rt 332 West / Newtown Bypass). Follow for approximately 3.0 miles to the sixth traffic light (One Summit Square is on the left corner at the intersection). Turn left onto Langhorne-Newtown Road (Rt 413 South). Follow for 1.0 miles to the second traffic light. Turn left into St. Mary Medical Center. See Campus Directions below. FROM TRENTON (via US-1) Take US-1 South past I-95 to the Maple Avenue exit. At the traffic light at the bottom of the ramp, turn left onto E. Maple Avenue (PA-213). Follow for 0.6 miles to the next traffic light (two gas stations on the corners). Turn right onto N. Pine Street (PA-413). Follow for 1.9 miles to the third traffic light. Turn right into St. Mary Medical Center. See Campus Directions below. FROM PA TURNPIKE (EAST OR WEST) Take I-276 (Pennsylvania Turnpike) to Exit 351 (US-1 Bensalem/Philadelphia/Trenton). Merge onto US-1 North (toward I-95 N / Morrisville). Follow for 3.8 miles to the Bellevue Avenue exit (toward PA-413). Turn right onto S. Bellevue Avenue for 0.1 miles. At the flashing red light, turn left onto S. Pine Street (PA-413). 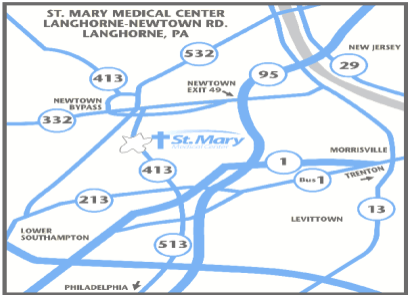 Follow PA-413 North for 2.7 miles (4 traffic lights) and turn right into St. Mary Medical Center. See Campus Directions below. Take the first left after you enter the campus of St. Mary Medical Center. Follow the road going past Lots 1-7. The road will curve to the right, go up a slight incline and after the 2nd blue sign turn right onto the parking platform (St. Clare Medical Building Floors 1-3) we are Suite 120. 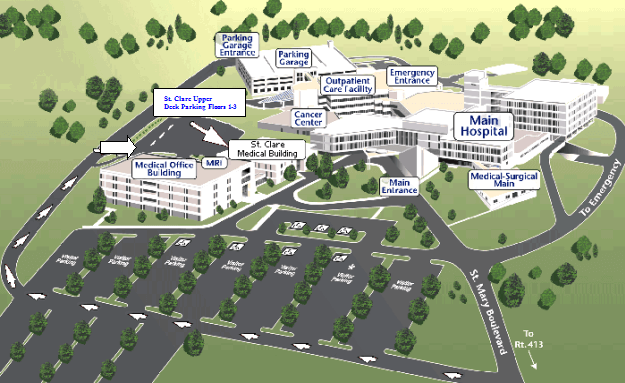 Below is a Map of the St. Mary Medical Center Campus. If the St. Clare parking lot is filled, additional parking is available in front of the hospital. Complimentary valet parking is available at the front door of the hospital. Shuttle vans are also available for your convenience throughout the parking lots.